At last, it is done. Voici Coney Island by Fig Tree & Company! I love how that quilt turned out! It's hard to believe that the top had been sitting, or would that be hanging, in a closet for so long. It's such a great feeling when a quilt has been completed. For me, complete means the binding has been sewn. No, it doesn't have a label, yet! I keep a yearly record of the starting and finishing date of my projects on a Word document. I began this system when I joined Stashbusters in 2007. I needed to know how many UFOs I had. It's amazing how much I get done in a year! Really!?!? I didn't do anything complicated. I used the square points on the cones as a guideline for my loops! I was going to do feathers on the sashing but...... I didn't like how they were turning out. So I croaked! I just wasn't able to figure out how I would connect the feathers between rows. Given that each block is done in the ditch, leaving the sashing area blank just wasn't an issue for me. Oh my goodness, this is just beautiful! I've long wanted to try this pattern and I think the fabrics you chose work perfectly with it! It is so beautiful. Love the colours you have chosen in it. You are not the only one having quilts in the closet that should have been finished long time ago. Carole, it's gorgeous. Love it. It's so pretty! Looks like big, yummy ice cream cones. Beautiful! I do love that Fig Tree pattern (well, I love most Fig Tree patterns). I love your color choices too. I'll remember your quilting ideas when I do mine! 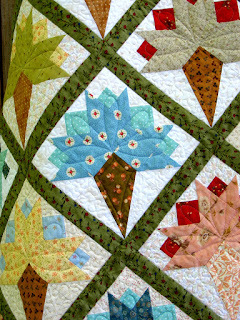 Looks gorgeous Carole...the quilting is perfect & the whole quilt looks great. I always liked that pattern...well done! Looks amazing...you did a great job! Great fabric selection for your Nosegay blocks. I do like seeing how a quilt is quilted so thanks for showing us. This is so nice. I have never made this block (is this the nosegay block) but I have seen it on several blogs lately. It really makes a pretty quilt and I think your quilting is perfect. It's beautiful! And, yes, simple IS good! Really gorgeous, Carole! I just love it...scrappy is the best ever! Oh my Carole....it's spectacular....I love the fabrics you used in your version. Oh boy add this one to my list. I'm with you simple is sometimes better. Wow Carole, it's beautiful! I love the way you quilted it too! Late getting here...and loving this one!! It is beautiful. Congratulations on a great finish. I'm so glad I had the opportunity to see this quilt during it's creation. Looks incredible. Is it hanging on the new treehouse? Oh, wait, that is the new-ish barn. Not the new treehouse. Your quilt is stunning! It's just a clasic- beautiful job on your quilting too! Love it! Love your quilt. Block 2 is my favorite. Carole, that quilt is beautiful. I love it. You did an awesome job.